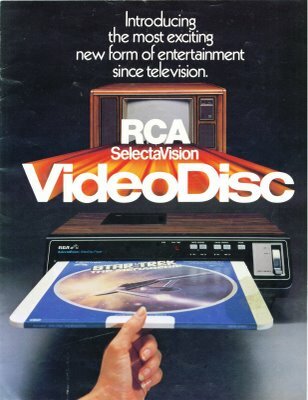 When I was little, my family owned an RCA Videodisc player. This groundbreaking technology, introduced in 1981, used an LP-sized disc encased in plastic, which was inserted into a slot in the front of the machine. Halfway through the movie, we’d have to take out the disc, flip it over, and reinsert it into the machine. On Friday nights, the whole family would pile into our Datsun King Cab (and if you think you can’t get a family of five into one of those, you’re mistaken), and we’d truck on down to the local video store to select our weekend entertainment. The videodisc, as an alternative to the just-emerging VHS cassette, did not last long, in popular usage or in my household. The videodisc player stepped aside to make room for the preferred VCR format, and by the 1990s, by the DVD player, which reigned until just a few years ago. What ties these formats together is their very physicality, and the necessity for a place to house all of these physical items. Accompanying the place itself was the natural community that developed alongside the business. Movie aficionados started working at these stores, looking to get closer to filmmaking and film appreciation, and started building their expertise. Independent video stores – which were basically all of them at the beginning before corporate owners started buying up local stores and remaking them as Blockbuster or Hollywood Video stores — began treating their roles as curators, placing certain films together in shelf displays, instituting the “if you like this, you’ll like that” style of film recommendation, and carrying obscure films to ensure a wide and eclectic array of cinematic offerings. Personal recommendations were paramount, and video store clerks were often treated as the experts, the one degree of separation between the casual movie viewer and the glamour and artistry of the film industry. Now, these physical formats are dying as audiences opt for the ease of instant streaming and downloading of digital files. And accordingly, video stores have also been dying – for years now, store after store has shuttered. Blockbuster and Hollywood Video went belly up. Netflix is booming, as is iTunes, Amazon and especially BitTorrent. But the physical formats still exist. Those DVDs and VHS cassettes don’t disappear and get repurposed as easily as a Blockbuster turning into a Super Supplements store. And the movie aficionados who gathered in communities at video stores haven’t disappeared. Many of them are instead maintaining their strongholds, digging in with a commitment to home video’s usefulness and relevance. And many of them are finding a renewed purpose and redefined role in the community. Where video stores were once a site for movie fans to rent or buy entertainment – for date night, family night, sick days when you need to lie in bed all day – many stores are looking beyond this role to preserve and continue their relevance. They are affirming their roles as curators (more than they were before) and, more importantly for what many consider a dying medium, their roles as archivists. Video stores – at least, the good ones – have always been bastions of curation, expertise and archiving. But rather than downplaying these roles and focusing on promoting the latest blockbuster rentals, many stores are championing their expertise and knowledge to secure their place in the local, national and global cultural landscape. 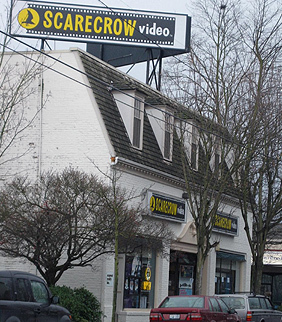 One of the flagship examples of how video store archiving and curation is being put into practice is Scarecrow Video in Seattle. Opened on December 8, 1988, Scarecrow Video connected movie audiences with 600 VHS tapes, which owner George Latsios gathered mostly from his personal collection. As the store has grown (now proffering 200,000 titles) and moved (from Latona to its current location at 5030 Roosevelt Way), it has also managed to remain a Seattle institution. Scarecrow has seen the growth and wane of various technological formats: the advent of the laser disc prompted Scarecrow to open up another store, Scarecrow Laser, but the decline of laser disc prompted the closure of that store in 1995. DVDs became de rigueur, and soon after, Blu-Ray discs entered the fray. 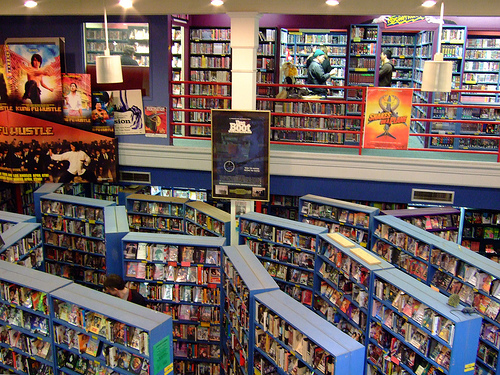 The store has undergone financial difficulties, as have nearly all video stores over the years and particularly as Netflix, Amazon and iTunes have severed many viewers’ connection to their local video stores. Yet Scarecrow has maintained an avid, devoted base of members and employees, and as the store’s financial difficulties became almost too much to surmount, it called upon these devotees to pony up. Scarecrow ran a crowd funding campaign to change the structure of the store into a nonprofit collective, driven by its new mission to emphasize preservation, access, education and community. In the first day of its campaign, Scarecrow raised 70% of the total $100,000 goal. After the month-long campaign ended, Scarecrow ended up with $130,697 from almost 2,000 different backers. This clear commitment from film aficionados near and far reaffirms that Scarecrow Video – and video stores in general – is relevant, needed, and appreciated. It also reaffirms that video stores can extend beyond just renting videos, because clearly for most video stores, that’s not enough of a draw. When video stores are having difficulties relying on the “business” side of video stores (the rentals and sales) to save the actual business, they shift to promote their function as libraries, as experts in curation, preservation and archiving. They appeal to their customers’ sense of history and appreciation for cultural preservation and education. Scarecrow is committed to enhancing film knowledge and appreciation. It is committed to nurturing movie fans’ love for and curiosity about cinema. And it’s clear that movie fans, in Seattle and beyond, are committed to Scarecrow Video, and to the tenets of preservation, access, education and community as well. Read about other video stores’ fights for survival and reinvention. Unfortunately, many of these fights are not successful, and some are forced to close their doors. Mary Erickson is Founder and Director of the Pacific Northwest Media Research Consortium. She once won a coloring contest sponsored by the local video store in Sandpoint, Idaho, and was awarded a video game (!). Her new co-edited book (with Doris Baltruschat) is Independent Filmmaking Around the Globe, to be published by University of Toronto Press in December 2014. Video stores are labor intensive. In an era of increasing payroll and benefit requirements such as increased minimum wage rates and ACA health care requirements video stores are at a huge disadvantage compared to the robotic counterpart (Redbox) and the digital counterparts (Netflix, Amazon, Hulu, etc). This is undermining brick and mortar businesses in general and, as shown here, the video stores in particular. That’s a good point, Fred. In these discussions (like so many around film in general), the actual labor involved to make this stuff happen is often overlooked. Small businesses struggle to compete, in part because you do want to have good working conditions and wages for your employees. That’s a delicate balance to maintain, and when your competitors have eliminated those challenges, the playing field is even more unbalanced.